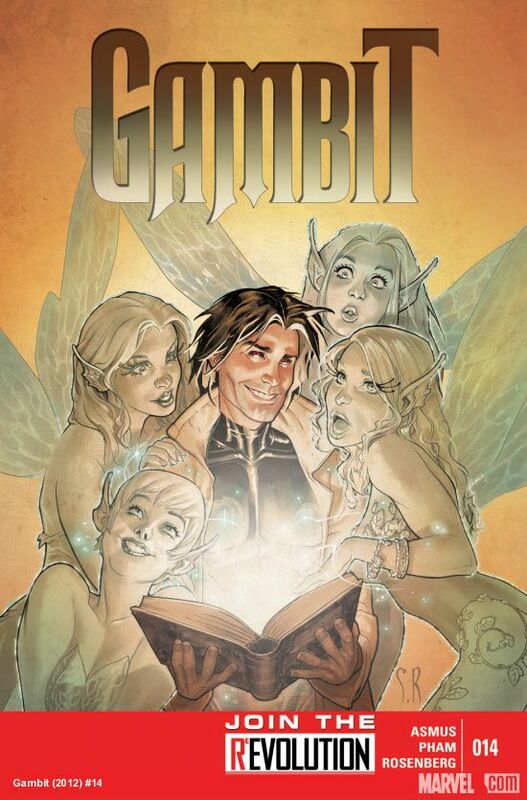 A funny thing happened on the way back to school, Gambit got pulled into the Fairy dimension where the ladies just loved him. I feel my world is complete. Other stuff happened in this filler issue, such as Remy and Pete Wisdom bro-mancing it up. Seriously, these two are awesome. I want to see a mini-series that is nothing but Remy, Storm, and Pete all together doing some kind of Ocean’s Eleven style mission/heist. Throw in Courier and X-23 and it will be a thing of beauty. Also liked the beatnik!Remy look, did he steal Cyclops’ sunglasses? I want to say yes. It’s funnier if it’s a yes. But getting to the bones of the matter, Remy really is having an identity crisis. He’s supposed to be a responsible role model now, but for a man of his background, that’s as alien to him as a human breathing water. And it’s not specifically said, but Rogue, the love of his life, being there probably doesn’t help much either. With only a few issues to go… any outcome is fair game for our Cajun hero. Has he truly matured? Or will he revert to what he knows best? Whatever happens, we’ll still love him anyway. Most likely.